Archaeologists from the Democratic People's Republic of Korea have discovered the lair of a unicorn ridden by the founder of the ancient Koguryo Kingdom. Koguryo (also Goguryeo or Kokuryo) was an ancient Korean kingdom that spanned the northern and central Korean Peninsula, as well as parts of China and Russia, until its fall in 668 CE. It was founded, according to the Korean Central News Agency of DPRK, in 277 BC by King Tongmyong. And it turns out that King Tongmyong was a serious, certifiable badass - because King Tongmyong rode a unicorn. Archaeologists from the History Institute of the DPRK Academy of Social Sciences have "reconfirmed" the discovery of a lair of the unicorn ridden by the ancient king, which is located 200 meters from the Yongmyong Temple in Moran Hill, Pyongyang City. They know it's a unicorn lair because a rectangular rock with the words "Unicorn Lair" carved into it stands out front. The scientists believe the words date back to the Koryo Kingdom, which existed from 918 to 1392 CE. 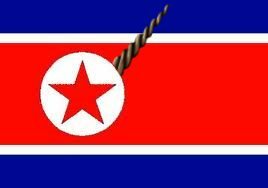 "Korea's history books deal with the unicorn, considered to be ridden by King Tongmyong, and its lair," History Institute Director Jo Hui Sung said in a statement. "The Sogyong (Pyongyang) chapter of the old book Koryo History, said, 'Ulmil Pavilion is on the top of Mt. Kumsu, with Yongmyong Temple, one of Pyongyang's eight scenic spots, beneath it. The temple served as a relief palace for King Tongmyong, in which there is the lair of his unicorn.' The old book Sinjungdonggukyojisungnam (Revised Handbook of Korean Geography) complied in the 16th century wrote that there is a lair west of Pubyok Pavilion in Mt. Kumsu." The discovery of the lair, he added, "proves that [North Korean capital] Pyongyang was a capital city of Ancient Korea as well as Koguryo Kingdom." That, of course, is the point: demonstrating some ancient, handed-down-from-the-gods claim of legitimacy on the Korean "kingdom." And you know what? That's good enough for me. I love science!